This is a copy of a recent post from my old web site – but worth repeating as I have recently been asked to speak several times about digital wellbeing. The term is one I coined – or at least found and brought into the education space (I’m not sure how original any of us can claim to be) – while I was working on a new Digital Capabillities framework for UK HE and FE (funded by Jisc) in 2015. Here, from the framework, is my definition. There is some discussion of digital wellbeing in the context of the framework here. It was challenging to insert wellbeing into a framework of individual capabilities, especially as I don’t think being well is only or mainly an individual responsibility. The design of learning systems, the contents of digital curricula, the distribution of digital know-how, the business models of digital development, the globalisation of digital labour… these are issues with profound impact on our capacity to thrive, over which no individual has control. But I think it’s useful, and potentially radical, to suggest that digital capability includes self-care, and that self-care requires a critical awareness of how digital technologies act on us and sometimes against us, as well as allowing us to pursue our personal and collective aspirations in new ways. In using the terms ‘capbility’ and ‘wellbeing’ in a digital space I am consciously drawing on Martha Nussbaum’s work on human development. Too rich to summarise here, her ideas are opened out nicely from an online review of her 2011 book Creating Capabilities: the human development approach. those capabilities that enable an individual to thrive (live, learn and work) in a digital society. In 2015 I was also conducting interviews with a wide range of staff, and considering the future of work both inside and outside education. I summarised these findings in my report Deepening Digital Knowhow: Building Digital Talent (first two sections) and in much more detail in Employability and the Future of Digital Work, part of a symposium for the Networked Learning Conference 2016. 1. I presented keynotes on digital wellbeing at the UCISA Spotlight on Digital Capability event and at EdTech15 in Galway, and at a range of events since then (see my slideshare account). 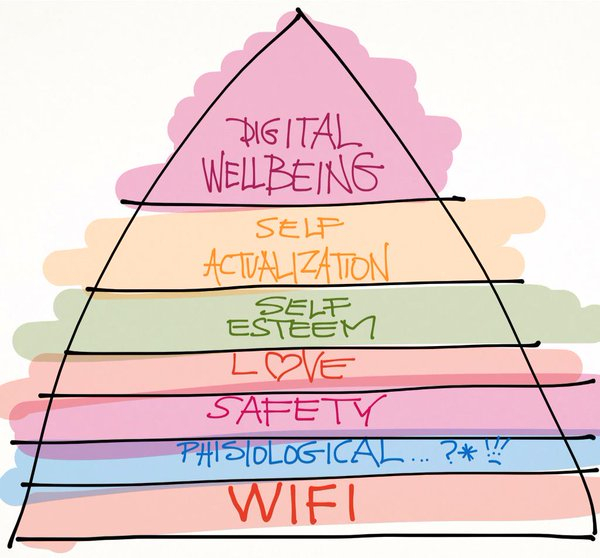 An #LTHEchat about the subject resulted in this re-drawing of Maslow’s hierarchy of needs by Simon Rae (thank you Simon). The link with Maslow is a reminder that digitally-mediated learning still happens between human beings with human needs for safety, nurture and care, for a sense of belonging and for personal attention. Other writers such as Laura Czerniewicz, Catherine Cronin and Gardner Campbell are raising the question of what love and care for learners might look like in digital settings. 2. 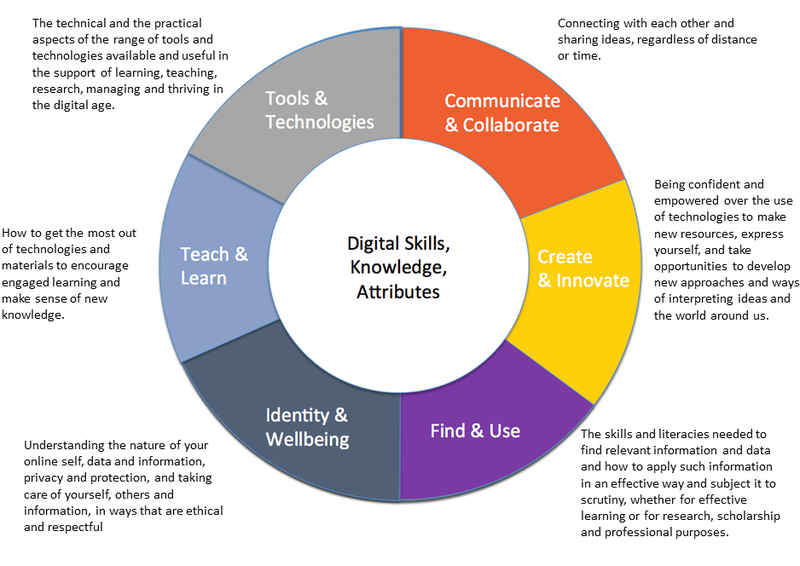 ‘Digital identity and wellbeing’ was included prominently in the Irish National Forum’s new (2015) framework of digital skills for HE, after conversations between myself and Jim Devine. You can see the final frameworks on pp. 35 and 36 of this report. Elsewhere in the report there is a useful account of how conceptions of digital literacy have evolved in the UK and Ireland, with evidence of how widely used are the digital literacy development pyramid (myself and Rhona Sharpe, 2009), the Jisc definition of digital literacies (myself and Allison Littlejohn and Lou McGill, 2010) and the two frameworks I developed for Jisc in 2010 and 2015. 3. ‘Digital wellbeing’ is a theme for the 2016 Designs on e-Learning conference in New York City, with the call for papers using a definition that closely follows mine in the Jisc framework. I like the connection between ‘design’ and wellbeing, because the two have often been antithetical in accounts of how people learn. ‘Learning design’ has tended to treat learners as rational users of a rational system or – worse – as components of the system to be known through measurement and tracking. Here they are treated as embodied, socially-connected and potentially vulnerable human beings, whose learning involves investment and risk as well as cognitive effort. 4. I was invited to talk about the framework with universities across Australia, which has led to the formation of a community of practice in digital capability development. Digital wellbeing was the area that elicited the most interest and excitement over there. The term ‘wellbeing’ resonates immediately with professional staff – librarians, careers advisers, learning skills professionals and other student-facing specialists – who support learners in ways that are not directly concerned with their subject knowledge or assessments. But teaching in its traditional sense also involves care: acknowledgement of everything learners bring to the experience of learning, including their motivations, challenges, and prior experiences, and an interest in their specific paths of development. 5. I was invited to contribute to a European framework on developing Digitally Capable Organisations which is being further developed into tools for use in schools. I have more recently been invited to contribute to a Commonwealth of Learning framework on Digital Education Leadership (forthcoming 2016). In both cases I think my contribution is to stress the responsibility that educational organisations have for the wellbeing of all staff and learners as they rely more on digital systems and introduce more digitally-based practices. 6. I’ve also been approached by health education bodies to consider developing a common framework. The wellbeing aspect of the Jisc framework is particularly appealing to this sector. 7. I’ve been approached to work collaboratively with specialists in e-safety and cyberbullying, who feel that ‘digital wellbeing’ is a particularly helpful term to use in post-compulsory education. Adult learners may not see themselves as needing support to be ‘safe’ or ‘respectful’ online, despite the fact that cyberbullying is an increasing problem in universities. But they are interested in how to live, learn and work effectively in digital spaces – for example to understand different norms and cultures of online expression. They also have legitimate concerns about how living, learning and working relationships play out differently in those spaces. One of the joys of working and publishing openly in a digital community is to watch ideas taken up in diverse ways, taking on their own lives and meaning different things to different people. As I’ve argued elsewhere, terms such as ‘digital wellbeing’, ‘digital literacy’ or ‘digital capability’, are useful only if they allow new conversations to happen, and ultimately if they usher in new forms of practice or critique. They belong to whoever can make use of them, and once they are no longer useful they fall away (though if they have had any traction, they leave changes behind them). For me the important thing is for there to be an open dialogue, recognising that ideas have a history and provenance, and that their contexts of production and sharing deserve some attention. Thanks for bearing with me. In further posts I’ll look at different aspects of digital wellbeing, depending on interest.